Once you’ve created a package, you may be interested in sharing it with your friends, colleagues, collaborators, boss, and maybe any useR in the world. In this chapter I will describe a couple of ways to share your package. The most straighforward way to share your package is to take the bundled package (.tar.gz file) and share it with whoever you want. Perhaps the simplest way to do this is to email the bundle file, or share it through a file-sharing service like Google Drive, Dropbox, Box, etc. To install your package, the users will have to download it to their computers, and then install it with the function install.packages(), specifying the path of the .tar.gz file. Or they can also use the menu options from RStudio’s Packages tab (see screenshot below). Another very convenient way to share your package is GitHub. I’m assuming that you have a GitHub account, and that you have some familiarity with this service. If you use GitHub to host your package source, the "devtools" function install_github() is the way to go. devtools::install_github() allows you to install a remote package. it downloads a source package, builds it and then installs it. by default, it does not build vignettes (to save time). to build vignettes use devtools::install_github(build_vignettes = TRUE). To know more about sharing options with Git and GitHub see r-pkgs: Package Git. 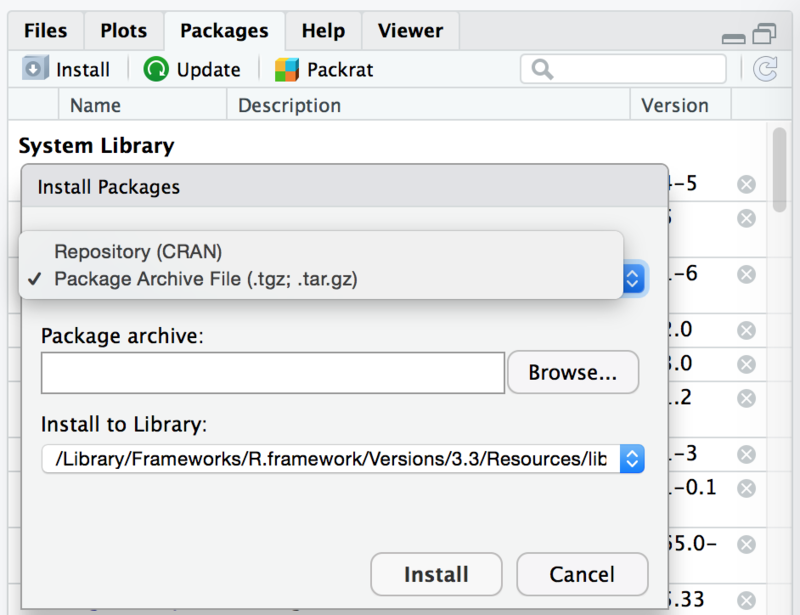 If you are interested in sharing a package via CRAN, then see r-pkgs: Releasing a Package.